There is very little that can entice me to get up at 4 a.m., but how often do you get a chance to bathe a Buddha? And not just any Buddha, but one that the actual real Buddha is said to have embraced himself. The statue at Maha Muni Pagoda in Mandalay, Myanmar, formerly Burma, is believed to be one of only five likenesses of Buddha created during his lifetime. And the daily cleansing ritual for the hundreds of pilgrims who attend is both literal and spiritual. 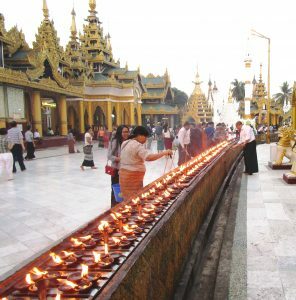 It is one of the many unusual experiences embodied in Myths and Mountains’ Myanmar Odyssey Tour. But the given that Myanmar is a beautiful and fascinating country that deserves to be visited and appreciated cannot be considered in a vacuum. The on-going bloodshed in the northern Rakhine Province where Muslim refugees are either being persecuted or are themselves Bangladesh terrorists, depending upon whom you ask, is part of the equation. I thoroughly understood the horror of the ethnic cleansing scenario about which I had been reading for almost a year, but I wanted to know the perspective of the Burmese themselves.But more on that later. 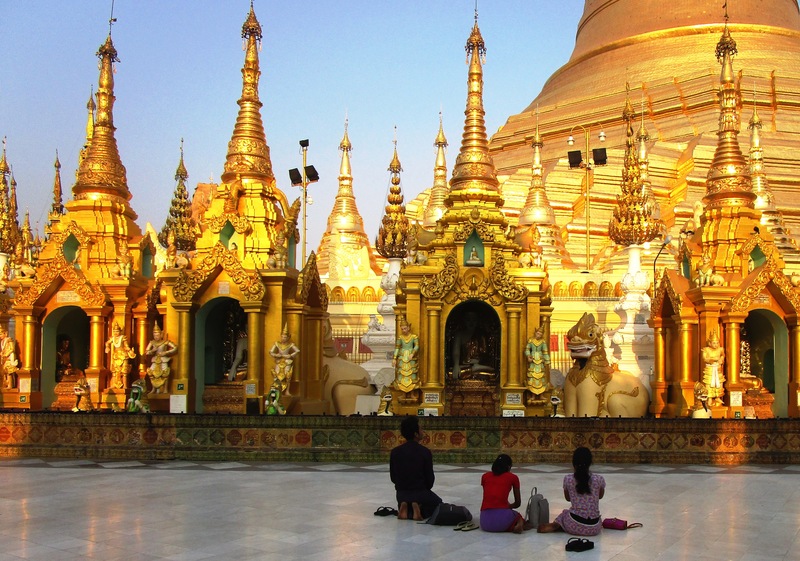 Starting our trip with a visit to Yangon’s Shwedagon Pagoda is like beginning a trip to Switzerland at the top of the Alps. There’s only one way to go after that, no matter how beautiful the descent. Built in 525 B.C., the immense complex is overwhelming to navigate and disarming to reflect upon — except for the escalators. They were a surprise. I was at a loss for words — not a good thing for a travel writer to be — to capture the mystique, magic and magnificence of the cosmically vast structure. We were invited to participate in the nightly candle lighting ceremony, said to promote longevity. We were first quite honored — until we realized that the expectation was that we would light all 1,000 wicks. Fortunately, other visitors chose to participate in the process along the way. Otherwise, we might still be there. The many shrines, pagodas, temples, stupas (dome-shaped Buddhist shrines) and monasteries that followed continued the sense of awe embodied in the attitudes of both the faithful and the infidels who visit them. And the amount and variety of offerings to ensure longevity, beauty, wisdom or health left me feeling guilty for arriving empty-handed.Golden pagodas as plentiful as the Golden Arches here, stupas instead of Starbucks on every street corner. Some pagodas are so lit up with gold-leaf engravings and flashing neon lights — sort of the sacred bordering on the sacrilegious — that I momentarily thought I might be at a DisneyWorld Buddhaland exhibit. More guilt for such a blasphemous thought. Stopping at a vineyard for a wine tasting seemed incongruous. 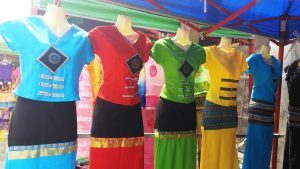 A visit to Shan State, home to 34 minorities, all of whom have different cultures, language, foods and clothes, boasts a much more other-worldly and ethereal terrain than Yangon. If, as our guide Willy kept reminding us, Myanmar has been so “isolated” — always conveyed in a conspiratorial whisper — here the feeling is even more remote. Just the presence of so many water buffalo lets you know you’re in another world. 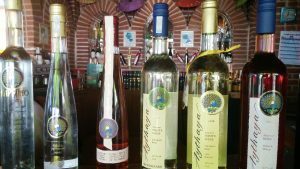 So stopping at a vineyard for a wine tasting seemed totally incongruous; nonetheless, I overcome my initial surprise to happily indulge. A visit to Inle Lake was more in keeping with the area. 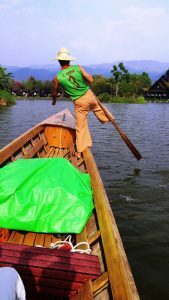 With its serpentine series of canals navigated by long, narrow boats, Inle is reminiscent of Venice and its gondolas, with an equal amount of commerce, all of it conducted on water. But even out-Venicing Venice, the houses, shops and schools are all on stilts. The hill tribe villages as well are a far cry from Venice’s cosmopolitan vibe. Not to mention that I’ve never seen a gondolier steer his boat or catch a fish with one leg wrapped around an oar, an amazing feat for which the Inthas are famous. 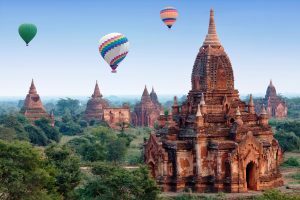 If every pagoda, shrine and stupa you visit on the ground is impressive, imagine floating over 2200 of them in a hot air balloon. Such is the glorious adventure in Bagon. It’s like watching over them all from heaven if only Buddha believed in heaven. Although, I have to admit, at this point, with my eyes glazing over at the mere mention of another pagoda, the thought of having to visit any of them once back on the ground made me want to stay in the balloon indefinitely, the champagne breakfast awaiting us upon landing notwithstanding. But no description of Myanmar is complete without discussing the elephant in the country: Rakhine Province. Over the last 10 years, Myanmar has been emerging from the Dark Ages to flirting with democracy, with the election two years ago, despite military rule, of State Counselor Aung Sun Suu Kyi. Now with the crackdown on the Rohingya Muslims, the country is veering from the cusp of a tourism boom to being a pariah throughout world-wide media. Prior to the trip, we were, of course, immersed in the global condemnation of the alleged military atrocities visited upon the Muslim population in Rakhine Province and the resultant censure of the country’s first democratically-elected leader. But the many Burmese I spoke to, not surprisingly, have a very different take. In a very over-simplified form, the Rohingya Muslims — self-named and not recognized by the Burmese — are Bangladesh terrorists who want to take over Rakhine Province and make it their own state. The Burmese say they shot up multiple police stations and have terrorized the Myanmar populace and that the military are only acting in self-defense. In addition, Myanmar is a very poor country that cannot afford the education, medical care and housing of 700,000 illegal immigrants who provide no economic benefit. The Burmese want them to all go back to Bangladesh. The U.N. and world stage, they say, have gotten the situation all wrong. It’s very hard to wrap one’s head around all the information, while also questioning just where all this information comes from. Meanwhile, on the flip side, Aung San Suu Kyi is beloved and has done a lot for the country in two years. No controversy here — parks are now free to locals where before they were not; education as well; infrastructure changes are apparent; trains and buses have been modernized and made very affordable; corruption among the governing generals has been lessened; the economy has improved and religious constrains lifted. Nonetheless, she is powerless, we were told, against the military which is pretty much still in control. Clearly this is a country very much in transition. No matter which perspective you accept — although it’s hard to rationalize the native assessment — the more important question for tourists is whether to visit, especially considering safety is not an issue here. What is always true when dealing with a government whose policies you reject, is that it is never the politicians who suffer when tourism decreases — it is always the people: the tour guides, hotels, restaurants, vendors and shopkeepers. 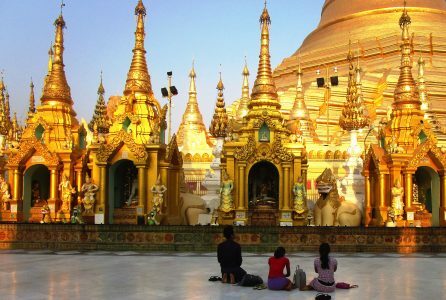 Myanmar has so much beauty and wonder and fascinating culture to offer that it is not only the country that will suffer if tourism declines but so too the many Americans who may choose not to experience this magical, mystical, memorable journey. Myths and Mountains operates tours and custom trips to a number of destinations in Asia and Southeast Asia.